Welcome to the Fabulous Hybrid Blog Carnival. Our topic this summer is BOUNDARIES! This post was written for inclusion in the quarterly Blog Carnival hosted by The Fabulous Mama Chronicles and Hybrid Rasta Mama. This month our participants reflect on boundaries in all of its many forms. Please read to the end to find a list of links to the other carnival participants. I have always felt like the freak of the family to some extent. My mother was always very supportive and even helped my hippie-ness thrive and grow. My father, on the other hand... I have been the weirdo. I can't blame them. I'm drawn to things that are not mainstream. However, this has created a sort of boundary awareness in me when dealing with my family there. I remember my dad saying he gave me bologna as my first food. I stayed present with my older daughter when ever anyone else was around. A lot of people actually liked to say they were going to give her crap to eat while I wasn't looking. I basically took these as threats and made it known that I would not stand for it. My family (on that side) haven't been especially supportive. They weren't particularly supportive of my breastfeeding. Or our decision to keep our son, knowing he had Down syndrome. So I have a sort of an imaginary wall or boundary up. I only share my weird parenting ideas / ideals when it is something that comes up in conversation on its own or I know it can not be avoided. They know that we do elimination communication because my daughter has sat on a potty in their living room and because I've taken both of these littles up to use their bathroom. some stuff slips through the cracks. I do not go to visit very often. In fact, I don't think they know yet that I have dreadlocks. (Although they might. My stepsister is a Facebook friend.) I think they've come to expect that sort of weirdness from me, though. I think I just find that I am guarded with them. I don't automatically expect acceptance, so I have to be prepared to defend my choices. On the other hand, they have welcomed anyone I considered family with open arms. I am proud of them for that. Are you completely open with your family about your parenting choices? 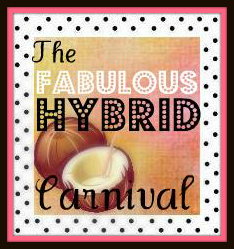 Visit Hybrid Rasta Mama and the Fabulous Mama Chronicles to find out how you can participate in the next Fabulous Hybrid Carnival! Boundaries For The Attached Parenting Sexual Abuse Survivor - Guggie Daly at The Guggie Daily discusses how to balance the boundaries needed by a sexual abuse survivor with attachment parenting. Setting Boundaries With Kids - Amy at Presence Parenting explores why boundaries may be more about us than our kids. Limiting Dysfunction - Wolfmother at Fabulous Mama Chronicles speaks speaks out about the underlying dysfunction in her relationship with her parents and the strategies she’s had to implement to ensure the psychological health of herself and her family. My Fence - Jorje shares how and why she she feels the need to be guarded with her family on Momma Jorje. How To Set and Enforce Boundaries – Jennifer at Hybrid Rasta Mama offers 6 suggestions on how to more effectively establish and enforce your boundaries, especially with those who blatantly disregard them. Boundaries in Breastfeeding - JW of True Confessions of a Real Mommy explores teaching personal space rules to allow a respectful breastfeeding relationship as well as honoring their own body autonomy. 3 Steps for Respecting Boundaries While Fulfilling Needs Within a Marriage - Kym at Our Crazy Corner of the World talks about three ways her husband and herself protect their own boundaries while still meeting each others needs. Establishing Boundaries With A Babymoon - Mandy at Living Peacefully with Children shares how important enforcing a babymoon was to establishing a new parental identity in the face of her in-laws. Planting The Seed: Teaching Kids About Healthy Boundaries And Saying No - MomeeeZen recently had to teach her daughter about setting healthy boundaries and about saying "No", even if it's to someone in your family. If you weren’t hippy-weird, you wouldn’t be you. And if your family does not like or accept YOU for who you are, well then they are missing out. It is always ok to be guarded. It is your prerogative and right how much you share and with whom. Never second guess yourself on that. And most importantly, just keep doing you. As an aside…I cannot wait for Spencer to get dreadlocks himself one day! How awesome would that be? You NEVER see anyone with Down’s Syndrome with dreads. I think he could make quite the splash and look uber cool to boot. We are definitely guarded about some things -- particularly discipline choices and medical choices. I just don't feel like debating it half the time and I never know who's going to be into a "That's a really dumb decision" mood so we just don't alway share. When I worked outside the home (and when I am in other settings), I am kind of hyper aware of conversations about parenting. I only bring up my "weird" ideas if someone seems open to new ideas. Otherwise, it isn't worth the effort, though I want to educate the world! Yes, we are very much guarded on a lot of our decisions with my husband's family. I like the idea of a fence, leaving room for the little, perhaps less impacting things to get through, but it sure can keep the big stuff out! Thanks, I'm not sure the metaphor would even have occurred to me if it hadn't been for snapping that picture of Sasha with the fence! I like it better than the idea of a wall, because I think it is impossible to not share anything with family. Creating with... well, what do we have? Sunday Surf: Birth and Spitting and More Birth!